at least one musical instrument. to reach clearance racks first. hybrids can not decide what they are. allow children to associate with them. Negative numerals should be avoided. flinging freezing rain in your face. and bright bouquets of fragrant daisies. until that day when your number is up. Joan McNerney’s poetry has been included in numerous literary magazines such as Boston Review of the Arts, Kalliope, Mudfish, Spectrum and Word Thursdays. Four of her books have been published by fine literary presses. She has performed at the National Arts Club, Borders Bookstore, McNay Art Institute and other distinguished venues. A recent reading was sponsored by the American Academy of Poetry. Her latest title is Having Lunch with the Sky, A.P.D., Albany, New York. The Easter Monday tradition in the ex-Soviet bloc country where Carl was living as an American transplant called for the boys to chase the girls, soak them with cold water (fortunately they used water guns now instead of the icy creeks that served the same purpose generations ago), and whip them with thin braided branches. The girls showed their gratitude for this treatment – which was meant to beat beauty and fertility into them, meant to make them even more appealing to the boys who whipped them – by rewarding the little boys with chocolate, and the older boys with shots of the local plum brandy that was indispensable at all celebrations and rituals here. When his wife first told Carl about the Easter Monday wetting and whipping custom, he hadn’t given it much thought; but this year, watching their own little three-year-old son get ready to participate for the first time, he felt odd. He tried to share his qualms with his wife, thinking, if I ever have a daughter, would I allow her to be wetted and whipped this way? So now Carl was watching his happy, sweet, boisterous son Billy trying to menace his shy little cousin with his whip of braided branches. Billy was dressed in his best Easter outfit and his round cheeks were smeared with chocolate and he couldn’t stop smiling. His father couldn’t help but smile too, but the clench in Carl’s stomach wouldn’t go away. He knew as he watched the girls’ eyes widen in surprise as the jets of cold water shot from plastic guns shaped like cartoon forest animals hit them between the shoulder blades; watched the girls’ eyes squint as the whipping dutifully followed; watched the girls’ eyes harden as they received vigorous slaps from the older boys. Carl watched the girls’ eyes as they handed over the chocolate or plum brandy to the boys, the girls’ backs still stinging and bodies still shivering, and he knew. The wetting and the whipping of her girlhood had made Carl’s wife beautiful and fertile, yes; it had also made her determined to come out on top, to be in control. Even though he’d never got his share of chocolate or brandy out of it, Carl was paying the price now. His wife grew up promising herself she’d never be wetted and whipped and made to thank a man for it again. Carl was living every day with his wife as if it were Easter Tuesday. He felt a sudden overpowering urge to take Billy, scoop his son up in his arms, clutch him to his chest, and run; run with only the clothes on their backs, run to some place where he could catch his breath and his sanity and think of a way to save his little boy from the life of endless Easter Tuesdays that might loom in his future, too. Then his wife was by his side, slipping her arm around his waist. Just then there was a commotion. One of the smaller girls was sobbing, her face wet from cold water shot from a cheerful plastic turtle by a little boy who couldn’t stop giggling. The girl bit him hard on his chubby calf, sending her mother into a fit of scolding, and earning the girl a slap on the bottom, which only made her cry more. A bigger girl – her older sister, maybe? – picked her up and smoothed her hair and whispered something in her ear. Ten years ago – that was the year Carl decided he had to leave home. He didn’t like to think of it as running away, as his mother called it; he liked to think of it as taking a leap into a grand and adventurous future. Now that it was a decade later, part of him had a disturbing tendency to agree with his mother. But the rest of him clung to the notion of adventure. That year winter had gone on and on and Carl, among all his friends and colleagues, had barely noticed it. It hardly registered that the lilacs bloomed so late they overlapped with the summer flowers. Not that he was the type to notice such things anyway; but she had been, the woman he loved back then, so he should have noticed for her sake. By the time the lilacs reached their full sweet-scented glory that late, last spring, she’d married his older brother, and Carl… well, he decided he needed to leap off something. Tall bridges being scarce, he took a leap into his future instead. He moved from upstate New York to Europe, took a job at a business college in a former Soviet bloc country, teaching English to young students whose parents thought they needed it to succeed and were willing to pay for it. Now married and raising a small son in a place so far from the one where he grew up, Carl noticed the lilacs again. They were different here, scragglier and less richly scented, but a lot more tenacious. They filled up hillsides almost like weeds, and they were all the same pale purple, no variety of special colors resulting from careful human intervention. If he was the kind of person to think about things that way, he’d notice how the lilacs mirrored his own experience: being one kind of person at home and another kind of person here, but somehow being the same person all along. Maybe his ten years here had made him more tenacious and resistant to human intervention, too. Maybe he liked that about himself. Although his mother always liked the sweet-scented white lilacs best. My name is Elizabeth Fountain. I live in Ellensburg, WA; my past careers include therapist, university administrator, day-camp counselor, and very bad barista; now I’m a faculty member and a writer. I write short and long fiction and creative non-fiction that finds the strangeness and unintentional humor in everyday life. My completed novel, Nearly Impossible and Completely Absurd, is trying to find a publishing home; it is the story of Louise Armstrong Holiday, the last person on Earth you’d expect to risk everything to save the human race. But in the face of a half-baked plot concocted by stupid but brutal aliens trying to create the largest cyborg army in the galaxy, Louie launches herself on a journey that takes her from a suburban Seattle business park to an ancient European castle, and ends in her own forgotten past. Helped by a mysterious co-worker and a blind mini-Schnauzer from Mars, she must conquer her worst fears and her oldest enemy, if she will ever find her way home. Two more novels are underway: You Jane, the story of a woman whose ability to write fables that come true wreaks havoc in her life and the lives of her best friends; and The Life and Death of St. Guinefort, a tale about what happens when Death tries to retire early. All my work reflects my motto, of sorts, taken from singer/songwriter Chris Rea: “every day, good luck comes in the strangest of ways.” You can read more of my work on my blog, Point No Point. swear that He’s worth living and dying for. Goliath’s parents–how they must have howled. I hope not in Hell, they deserve better. could make up then. Maybe we’d be happy. fee because I need to make a living. smack. But then I’d just be betraying myself. Gale Acuff has had poetry published in Ascent, Ohio Journal, Descant, Adirondack Review, Ottawa Arts Review, Worcester Review, Verse Wisconsin, Maryland Poetry Review, Florida Review, South Carolina Review, Carolina Quarterly, Poem, Amarillo Bay, South Dakota Review, Santa Barbara Review, Sequential Art Narrative in Education, and many other journals. He has also authored three books of poetry: Buffalo Nickel (BrickHouse Press, 2004), The Weight of the World (BrickHouse, 2006), and The Story of My Lives (BrickHouse, 2008). Gale has also taught university English in the US, China, and the Palestinian West Bank. Neil Ellman lives and writes in New Jersey. He has published numerous poems in print and online journals throughout the world. They may be viewed in such publications as Anastomoo, Bolts of Silk, Counterexample Poetics, ditch, Berg Gasse 19, Clutching at Straws, Deep Tissue Magazine, Eunoia Review, Indigo Rising, A Handful of Stone, Otoliths and The Montucky Review, among others. He put coffee into the coffee maker. He put water in the coffee pot. He turned the coffeemaker on. He went to work. Albert came home, ate a frozen dinner, watched TV, and then went to sleep. He put coffee into the coffeemaker. He put water in the coffee pot. He turned the coffeemaker on. He put coffee into the coffeemaker. He put water in the coffee pot. He turned the coffeemaker on. He went to work, came home, and went to sleep. He woke up. The coffeemaker was already on and brewing coffee. He woke up. The coffeemaker was in bed with him. He got up, went to work, came home, and went to sleep. He put coffee into the coffeemaker. He put water in the coffee pot. He turned the coffeemaker on. He turned the coffeemaker off. He turned it on again. He fell asleep. He turned the coffeemaker on again. He woke up. He turned the coffeemaker on. He woke up. He turned the coffeemaker on. He turned the coffeemaker off. He turned it on again. He woke up. He turned the coffeemaker off. He turned the coffeemaker off again. The coffeemaker wouldn’t turn off no matter how many times he flipped the button. A mug of coffee was sitting on the nightstand. He drank it. He fell asleep. He turned the coffeemaker on. He thought he had turned the coffee maker on, but then remembered that he had only done that in a dream, so he went to turn it on. But it was on already. AARON DIETZ is the author of Super, a novel from Emergency Press about commitment, crisis, paperwork, and heartbreak. Dietz’s super powers include a high metabolism and the ability to put things back where he got them. He’s also pretty good at math. 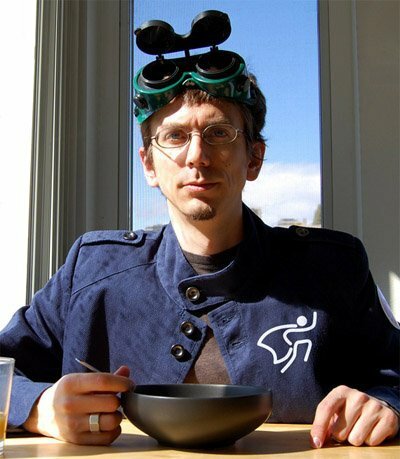 As an instructional designer, Dietz has written online high school courses on computer programming, green design, and 3-D video game creation. He’s also been paid to count traffic and once failed a personality test. Dietz writes for TheNervousBreakdown.com, blogs at aarondietz.us, and is an advisory editor of KNOCK Magazine.